With so many brands of energy drinks on the market today, people seem confused about which energy drinks are better suited for them. In a recent survey conducted at an Albertson’s in Las Vegas, Nev., dozens of shoppers compared the new Bionic Tonic to other top-brand energy drinks, such as Red Bull, Rockstar and Monster. Of the 158 shoppers surveyed, 136 said they preferred the taste of Bionic Tonic. The all-natural drink contains ingredients that contribute to energy and wellness without having the carbohydrates, sugar and caffeine found in competing energy drink products. 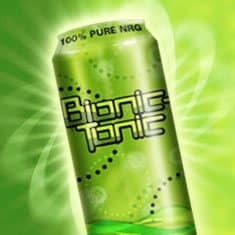 Bionic Tonic is quickly becoming the preferred energy drink in Las Vegas and other parts of the country. Bionic Tonic is allnatural, high-energy drink with zero sugar, carbs or caffeine. Bionic Tonic allows for a an increase in energy by using a proprietary formulation that lacks the fattening ingredients and caffeine found in traditional energy drinks that cause short bursts of pep known as the “crash.” Bionic Tonic uses only the finest natural ingredients available which assist metabolic levels and burn calories. Among the ingredients are: maca root, high in nutritional value similar to cereal grains, credited with aiding stamina; green tea extract, rich in catechins with antibacterial properties; polyphenols, powerful antioxidants credited with inhibiting the growth of cancer cells; gotu cola, referred to as the memory herb; Vitamin B3, which aids in digestion; Vitamin B4, which is water-soluble, stimulates brain function and helps the body convert protein to energy; Vitamin B5, which converts carbohydrates and fats into sugar the body burns to produce energy; L-carnitine, an amino acid found in nearly every cell; and cayenne pepper, which is catalytic in nature when used in conjunction with other nutritional supplements and improves blood flow. The company is Las Vegas-based and distributes its products through fine retailers nationwide. The company has a direct-ship program where customers can order carton or case quantities for home or office delivery. The drink is used by Ultimate Fighting Challenge fighters. Frank Mir, Former UFC Heavyweight champion, and Ken Hahn of the gym, “Striking Unlimited,” are coaches on Spike TV’s The Ultimate Fighter series, and they are endorsing the product through commercials and promotional venues. For more information on “Striking Unlimited” please go to www.strikingunlimited.com. Currently the gym is offering a free class to anyone that may be interested in joining. Bionic Tonic recently became the official energy drink of the “Striking Unlimited” MMA Gym of Las Vegas, Nevada, where some of the best fighters on the MMA and UFC circuits coach and train. Fighters have stopped drinking other energy drinks such as Red Bull, Throwdown and Rockstar and armed themselves with the natural energy and refreshing citrus taste of Bionic Tonic. Bionic Products is a Nevada corporation (Symbol: BNPD) formed for the purpose of discovering, developing and marketing breakthrough energy products to enhance the health and wellness of consumers. For information on Bionic TonicTM, visit www.bionicproducts.us.